Food prep became hot faster than those 100 calorie packs of stale, unsatisfying cookies that stole our vulnerable hearts and waistlines a while back. Instead of whole aisles dedicated to processed snacks touting low calories and even less fat, now we’re bombarded with thousands of pins, posts, even whole books dedicated to the subject of cramming a week’s worth of cooking into four hours and a dozen plastic containers. I don’t much care for either trend, if I’m honest. Anyone else feel like food loses most of its romance when it’s enclosed in plastic and/or warmed in the microwave? Look, I don’t hate the player, just the game. But I totally recognize there are occasions when it makes sense to get your head in the meal prep game, and I’m here to help. You hate to cook: You’ve never once felt “romantic” looking over cookbooks, chopping carrots, or sprinkling a basil chiffonade over your pasta. Go ahead and knock out your cooking on Sunday. Don’t torture yourself each and every night of the week. Get it off your mind and in your fridge so you can spend your evenings doing you. You’re crazy busy: You’ve forgotten how sunlight feels on your skin because you leave the house and the office when it’s dark. Reheating your meals in the microwave may not feel romantic, but it’s considerably sexier than eating popcorn and drinking a bottle of wine for dinner (unless you’re Olivia Pope). You’re on a diet: You think about lunch the moment you’ve finished breakfast and you’re already contemplating Tuesday’s dinner. I’m the Captain of this team! Planning and portioning out meals ahead of time makes it so much easier to make good choices. When your meetings run long and you’re starving, it’s easier to avoid the allure of queso and a basket full of chips when you’ve got a healthy and delicious meal waiting in the fridge with your name on it. You’re on a budget: Your Mint app is sending you frantic alerts about exceeding your budget for eating out, and you’re a week into the month. While eating out may seem like a time and money saver (especially if you’re cooking for one), I promise you’re spending more and getting less when you’re not making your own food at home. Save up for that five-star gourmet restaurant you’ve been salivating over by making your lunchtime salad at home. I guarantee, it’ll taste better anyway. If any of the five, no wait, four characterizations above apply to you, listen up. As much as I’d prefer to make a hot, homemade meal every evening, sometimes life gets in the way. But that doesn’t have to be an excuse to eat unhealthy, unsatisfying meals. By investing just a few hours each week, you and your family can approach every meal with anticipation instead of anxiety. Here’s my game plan: I start by making a list of the meals I’ll need for the week, usually something like five breakfasts, 3 lunches, and 4 dinners. The amounts will vary depending on your schedule. One girls’ night and a catered lunch meeting means less prep work for you! Next I choose two proteins. 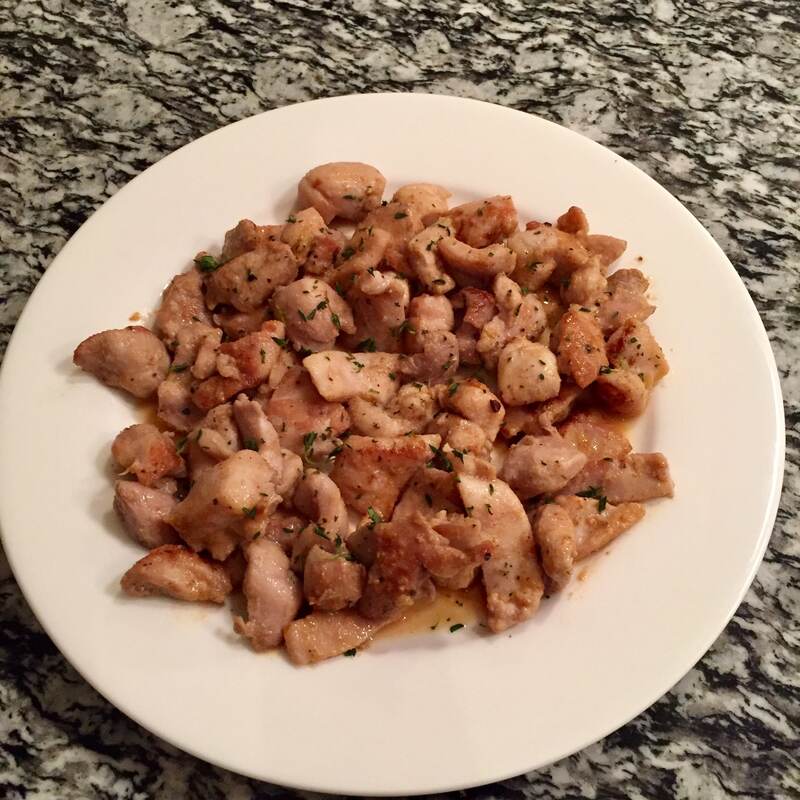 A double batch of my Five Minute Chicken is delich and super versatile. My Roasted Pork Loin feels a little fancy and makes for a satisfying dinner. 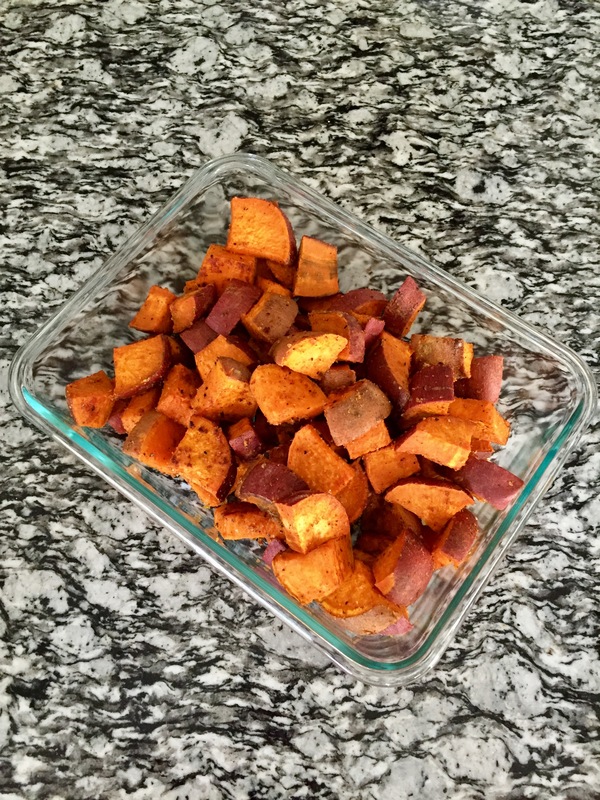 To go along with my main dish, I usually make a pan full of Savory Roasted Sweet Potatoes and either steam or roast a green veggie like broccoli or asparagus (both can be prepared in less than 10 minutes). For breakfast we keep it simple. 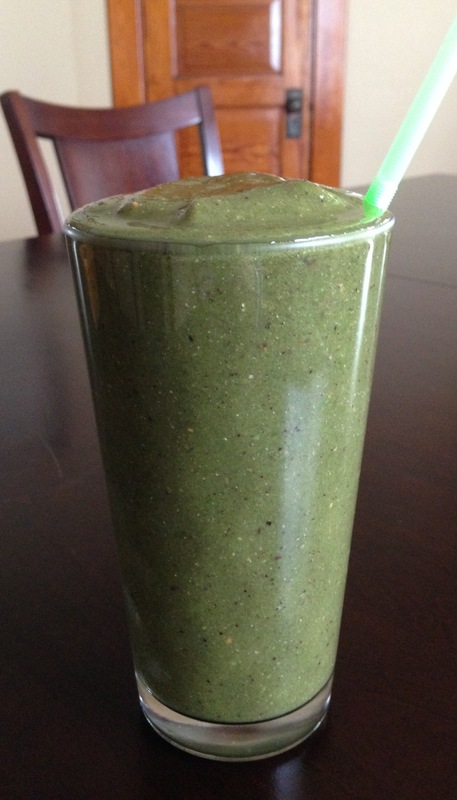 A big bowl of seasonal fruit, cut up two or three days in advance, or a green smoothie, quickly thrown together in the five minutes before walking out the door, always do the trick in keeping us full and energized until lunchtime. 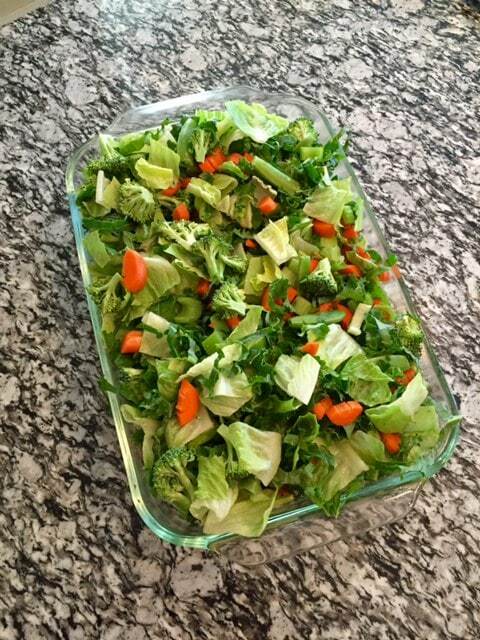 Last but not least, I make a huge salad that I keep in the fridge all week and portion out as needed. Whip up a batch of my balsamic vinaigrette and you can pat yourself on the back for saving $10 on your usual lunchtime salad. 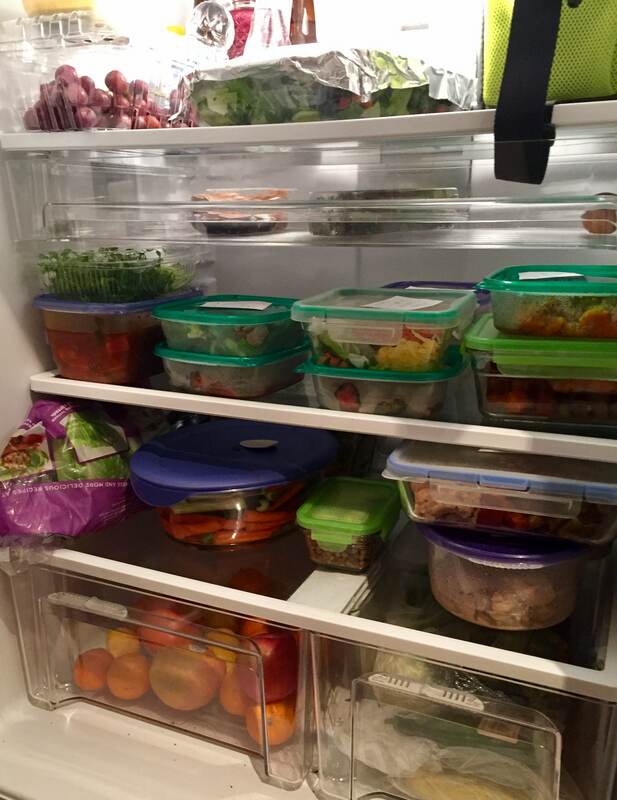 Once you’ve prepared the food, take a little extra time to portion out your meals and label your containers. It takes the guess work out of mealtime. I like to differentiate the meals by mixing up the proteins and sides. For example, on Monday I’ll package up a serving of chicken with a big salad. For dinner that night, I’ll have the pork, sweet potatoes, and broccoli. On Tuesday, I’ll switch it up by cutting the pork into bite-sized pieces to go on top of a salad and pairing the chicken with the sweet potatoes and asparagus. Alternate the combinations to keep things interesting. A person can only eat so many chicken breasts with steamed broccoli before losing it and downing a “share” pack of peanut butter cups. I know that when you hate to cook or you’re crazy busy, on a diet, or working with a limited budget, the last thing you want to do is waste a perfectly good day at the grocery store or in the kitchen. Sometimes I struggle to convince myself to use up one of my weekend afternoons filling plastic containers full of chicken and sweet potatoes too, but I’ve never once regretted that choice during the week. So get in there! Make your list, check it twice, and don’t spend a minute more agonizing over the what, where, when, or whys of feeding yourself. You’ll be glad you did, promise!